He made the request at a national conference in the Central Highlands province of Lam Dong on July 30 that sought solutions to attract more business investments in the agriculture sector. The conference, the largest of its kind, attracted the participation of more than 800 representatives of businesses, associations, and international organisations, along with experts and scientists. The leader set the target of Vietnam becoming one of the world’s top intensive agricultural processing and trade promotion centres in the next decade. To that end, the key barriers in the way lie with enterprises investing in this sphere, he said, urging ministries and localities to continue with administrative reform, especially land-related procedures. The PM suggested that 50 percent of administrative procedures in agriculture and rural development be reduced, with tax procedures streamlined. He also underlined the need to improve the quality of planning work and competitiveness, and focus on vegetables and fruit, seafood, herbal medicine, and other key products like rice. PM Phuc called for efforts to revamp mechanisms on trade promotion, thus helping businesses access foreign markets, especially those in China, the US, and the EU. Apart from increasing loans for individuals and households to the maximum level without mortgages, it is necessary to extend those entitled to credit policies in high-tech agriculture, he said. The leader requested that domestic enterprises and businesspeople carry forward the startup spirit and corporate ethics, while joining hands with the Government and farmers to bring Vietnamese farm produce abroad. 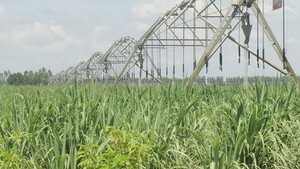 According to the Ministry of Planning and Investment, 49,600 businesses have invested in agriculture in Vietnam, covering production, processing, sales, agricultural materials and services. They have created more than 4.5 million jobs in the country. In 2017, nine Vietnamese agricultural products recorded an export turnover of more than 1 billion USD each. In the first half of this year, such products as seafood, coffee, fruit and vegetables, rice and cashew nuts made outstanding performances in export. However, delegates at the event pointed out some of the shortcomings in the sector such as unsustainable development; low productivity, quality, efficiency and competitiveness; small-scale, limited investments; slow application of science and technology; and reliance on weather conditions. 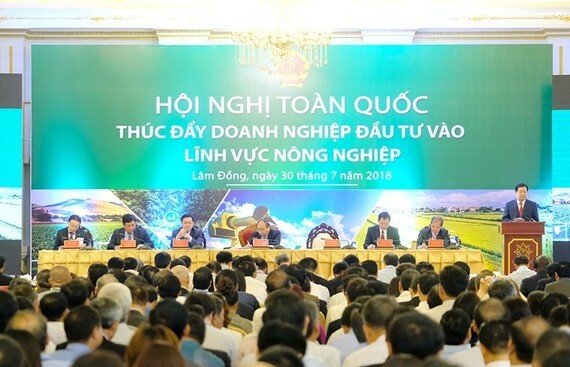 PM Phuc said although up to 70 percent of Vietnamese are working in agriculture, the sector makes up only 18 percent of the national gross domestic product (GDP), emphasising the need to re-organise agricultural production and increase scientific-technological application in this field. Deputy Prime Minister Trinh Dinh Dung said in the context of intensive and extensive international integration, it is necessary to set out solutions to help Vietnamese firms participate more deeply in the global value chain in agriculture, and promote their brand names. The official also stressed solutions to raising awareness amongst enterprises of observing laws, fulfilling international commitments and responsibility for environmental protection, ensuring food hygiene and safety, and implementing social policies. Minister of Agriculture and Rural Development Nguyen Xuan Cuong said it is a necessity to restructure the agricultural sector, focusing on goods, with businesses at the centre.